This is what I wore on Monday to go see Kate. I feel like I really should get back into the swing of posting what I wear on the actual day I wear something. Just been a bit all over the place in the last two weeks with pre shooting outfits! I hardly ever wear my Allegeras any more, I think because they got so popular I decided I didn't like them. Such a hipster. The dress is the Petite version of the grey marl midi dress that Topshop has at the moment but that just drowns me. I have so much love for grey marl jersey! It just has a lovely slouchy off duty feel to it which I love. The necklace was something I picked through ASOS Future Stylist as I had my eye on it for ages! Im off to a Viktor & Rolf product launch for their new Spicebomb fragrance tonight, which is actually a male fragrance but I LOVE male smells. My favourite Man smell is Versace Blue Jeans, which I used to force all my ex boyfriends wear. I smelt it on the tube (makes change from B.O.!) the other day and was sitting there sniffing this man! Haha. The oyster holder is from this ebay seller, and I just cant get enough of it so I just had to include it! Lovvvving this look big time! What a hottie you are! I really really really like this outfit! Proper ace outfit! Especially the patterned scarf. Have fun at the event! Leather and tartan is one of my favourite pairings. Love the allegras (I need a pair...) and the spike necklace is coool. I LOVE THIS SCARF SO MUCH! Ahhh I need those boots, I really do! Love your Tuexdo nails but it won't let me comment on your blog...it does nothing when I click. now this is an outfit that i love. you look fierce!! Ahh, such a cool outfit! I'm desperate for both that necklace and some Allegras, so as you can imagine I'm rather jealous right now. Anyway, you look fabulous! 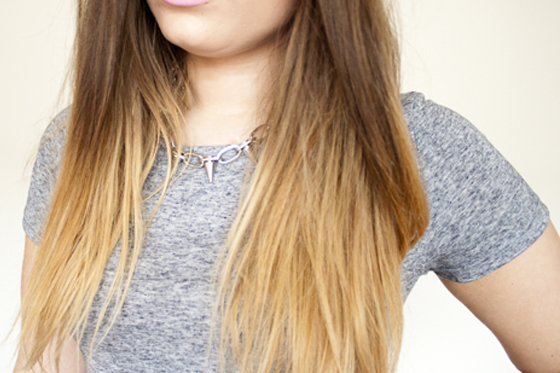 im so jealous of your ombre hair, its so pretty! and i love the outfit, i love your style! you look so pretty in these photos! I love everything about this outfit, especially that scarf! Love your outfit, I really want that Topshop dress, just got a voucher so fingers crossed, every time I've walked into Topshop I've oohed and aahed over it! You look lovely! Aww it must be so great living in London! :) Loving the oyster holder, so adorable! Love EVERYTHING about this outfit, the dress looks so good on you! I know what you mean when you buy something then it becomes REALLY popular, but they look great on you so you shouldn't worry about it! Love your outfit. There is a lady here who always wears men's cologne for the same reason, she loves the smells. Nice you've settled into London life and you get to go to more events - so jel! I love everything grey marl too, missed out getting a maxi from h&m like it and kicking myhself cause I can't find it anywhere now :'( wah! yeah Im loving it,so happy to finally be down here and be able to go to things more often! Looking forward to zomg! its gonna be a proper epic event! 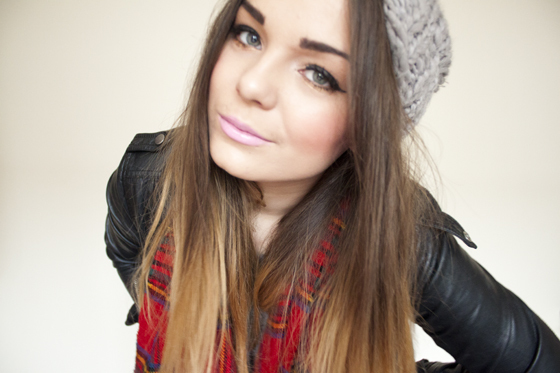 I love this, girly grungy, cannot get enough of that scarf! I have the midi version of this dress and I love it and definitely need to get my hands on this one too to complete the set! i just did pink cheetah print nails!!!! This has just inspired a spontaneous purchase of a tartan scarf! oh my gaaad i love this outfit! soso good. the grey and the scarf just go together perfectly. hope Londons all good! very jealous you're living there. tis ma dream! Love the outfit but especially love the nails! They look fab. Gorgeous outfit, I love the dress on you! its so comfy and easy to wear, great transitional peice too! highly recommend getting it! Possibly one of my most favourite outfits I've seen you in. SO good! LOVE this outfit. it's so grungey, you look so good like this. love the leather jacket! 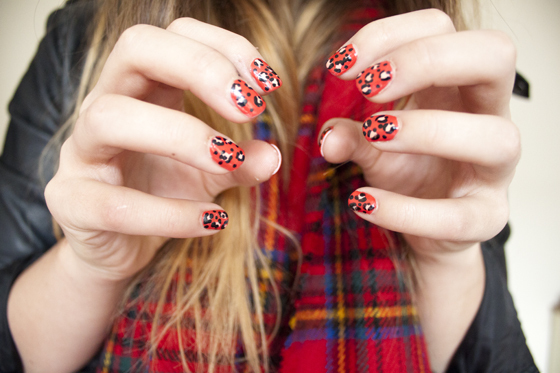 I love your nails and the scarf. 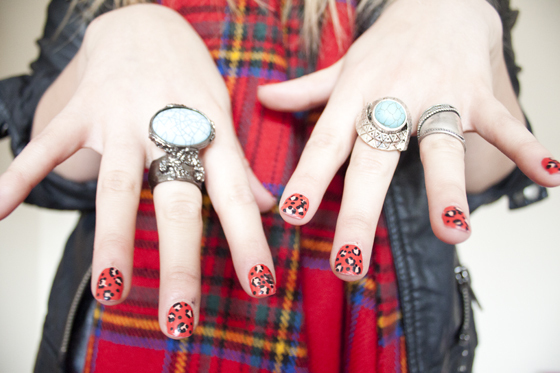 Big fan of anything tartan! spicebomb is REALLY nice! very unisex actually and very long lasting! i had a lovely time at the event! have you changed your blog name too? I loooove this outfit, it feels like you're channeling 'grunge' but have put a modern spin on it. That scarf is brill and really pops against the grey and black. Saw your nails on Instagram, love them! really?? hahah I bought this like three years ago! didnt realise it was a thing! woo go me! haha im the same, hate when things i like become too popular and dont wanna wear them anymore! i love your nails, ive tried doing them like that in the past but it disnt come out too well! hahah glad im not the only one!was just so sick of seeing them everywhere i just had to stop wearing them! cute and casual! especially loving your nails here! I love how that simple grey dress looks amazing here! And I've got serious nail envy. They are lush! why would that offend me haha! thats the look i was going for! yeah same here! i tried the midi on (which was practically a maxi on me!) and was so sad!i hate being so short sometimes,so glad they came out with the shorter one! petite ranges ftw! i find topshop dresses so long on me! 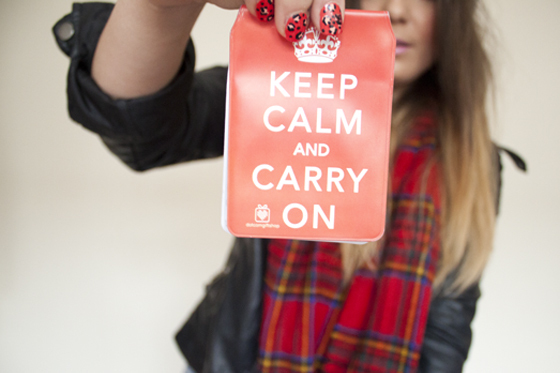 love the oyster card holder, need to get me one of those! Love the jacket! Want the same. love this outfit! especially the leather and the tartan together! Absolutely gorgeous! Your style here kind of reminds me of Caroline Flack? Dunno, I always think she has amazing fashion. Following! The first thing that came to my mind for this outfit was "laid back" for you haha. I love the tarten scarf with the black jacket. baaaaaa why did i get the midi one instead of this! i m having difficulty styling it! I Love your hair, nails and the way you have your make up:) You look really nice in these pictures and I love the jacket so much, it really suits you and i cant believe its only from primark! I love the beanie as well as the dresses! I was put off that dresses for ages because of how long it is but in case that it comes in petite I might essential to invest,besides,all nail polish color,at all events, in case that you will want to know some information about all necessary fashion Nail Fashion as well as others info. so you will can to visit this site for achieve some information. I have the dress on its way to me! Can't wait to wear it, am thinking of wearing a jumper over it and maybe a little peter pan collar! I love the scarf to, might have to purchase that! So cute. I've been looking for a lipstick this color. Can u please tell me what it is that u r wearing?